Hakumei to Mikochi got its 13th episode finally. This directly continues the manga story where it was left, offering us few short stories that are of the calming sort - just like so many of the earlier episodes. We meet our weasel-carpenter who yet once again saves the day. Not because it is his job, but because he is a kind person who genuinely wants to help others. Surprisingly enough, our second story takes place inside winter scenery. Real beauty that one. At first, it felt weird how, despite the heavy snowing, there was no nature's sound present. Then I remembered how small our characters are and have to conclude snow has never looked as soft and fluffy in anime before as it looked now. The final part introduces us to a new Japanese gambling game which makes the series look like Kaiji (obviously less moe because Kaiji is super moe). Typical to Mikochi, even our games play along in a cheerful and friendly atmosphere. We see yet another evening where everyone is enjoying their time together so much it's practically impossible not to smile when witnessing this. Mikochi is so goddamn happy and charming series, and this exact episode is a perfect example of how good the show can be at what it does. The biggest flaw is how the series is only 13 episodes long instead of 50 like Shirokuma Cafe is. Those who loved the original series will be very pleased with this one. This is the coziest episode of one of the coziest series in history. The first part is cute, but ultimately a throwaway story that others have summarized. The main story is the gambling. It's everything Hakumei to Mikochi does best: let these characters just do their own thing, enjoy the situations that unfold, and watch the (very low key) chaos fly. It was precisely how you'd want to hole up on a cold, snowy night. Good friends, games, sharing jokes, hot food, and a bit of alcohol to warm you up even more. It made me feel nostalgic for some nights like that in the past. I suppose it made me feel a bit sad, although I laughed much more. But I think that's part of Hakumei to Mikochi's charm as a series. It reminds us of the most important things in life...many of which are unappreciated in your average anime series. I'd rather live in the small, simple, quiet, and charming world of this series than any giant dramatic anime of any kind. I truly hope we can see more Hakumei to Mikuchi to come. I would hate to say goodbye to the lovely art and exceptionally high quality adaptation that we've seen in this series. It's been faithful to the manga and a gift to all those who have enjoyed the experience. The Hakuemi and Mikochi is essentially just a 13th episode of the series. If you enjoyed the television series you should be able to enjoy this one. The OVA is split into two parts, the first part focusing on the Hakuemei's work partner, Iwashi, and the hair stylist, Jada. 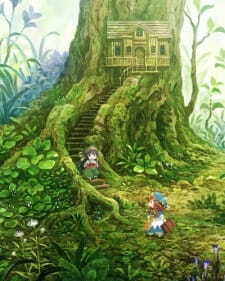 The second part focuses on Hakumei and Mikochi as well as two new character, inn sisters Mimari and Shinato, who act as your classic nice and well-mannered little sister and loud and rude older sister (think Kyou-Ryou (Clannad) or Kagami-Tsukasa (Lucky Star)). As always, this anime has a unique art style and soothing soundtrack that fits extremely well it's relaxing tone. It'll almost be like you're cuddled up to the fireplace with the characters, it's just that comfortable. Since this is essentially an extra episode of the television series and since I've already talked about the new characters, I'm going to assume you're already acquainted with characters so instead of describing them, I'll talk about what I think makes this OVA special, the character interactions. You're always in for a treat when you see characters who have yet to meet finally get to that point and interact. Jada's lazy, yet welcoming attitude fits extremely well when coupled with Iwashi's kindness. Like any good slice-of-life, Hakumei and Mikochi's characters make what would usually be a boring task into something interesting through how the characters interact with each other. Overall, if you enjoyed the original television series at all, I would definitely recommend watching this OVA as well. And if for whatever reason, you haven't watched the original television series yet, I would recommend doing yourself a favor and watching that, and then coming back and watching this.